Not content with refreshing its mid-ranking Pegasus range from stem to stern for the fourth time in its relatively short life, Bailey has gone one step further by adding three new models and heavily revising another. Of the new models being offered, we think the new Modena is the most intriguing, offering as it does the latest Verona’s hugely desirable French bed/end washroom layout, but squeezed into a caravan that’s more than 0.6m (2ft) shorter and 175kg lighter when fully-laden. Better still, it’s a bit cheaper too. Obviously, the beds up front are shorter (but then, the Verona’s 1.6m (5ft 3in) settees aren’t long enough to serve as adult beds anyway), but the French bed out back remains the same size. And if there’s a real, discernible difference between the two caravans’ full-width end washrooms, then you’ve got better eyesight than we have. And of course, the Modena (named, incidentally, after the Italian town where Ferraris are made) boasts all of the many improvements Bailey has introduced into the latest Pegasus, including a Unicorn-alike exterior and interior and – finally – Polar White bodywork. The problem is, Bailey’s rivals haven’t exactly been standing still in the time it’s taken for Pegasus IV to take over from Pegasus III (aka ‘GT65’), so does it have what it takes to come out on top? And to see other Bailey caravans for sale, click here. If your towcar weighs no less than 1500kg (and its towing limit allows), then you can pull a fully-laden Modena, safe in the knowledge that you have an 85 percent match. Better still, anyone comfortable with a 90 percent match will still be perfectly okay with a car weighing around 1417kg. At 6.49m (just over 21ft) long, too, this is far from an over-long and unwieldy caravan, so pushing it onto your pitch by hand should be perfectly possible. Come pitch-up, you’ll find the corner steady winding bolts fairly easy to locate front and rear, and that most of the services are banished to the offside wall, well away from the awning. The key word here, though, is ‘most’, since Bailey has decided, for whatever reason, to position the side-mounted gas locker on the nearside wall. Better this than the grey water drains, we suppose, but it’s still a minor disappointment. There are two more locker doors on this side too, of course, but each simply affords easy external access to the bedding lockers beyond. As you’d expect, the aperture for the French bed locker is rather bigger than the one up front. We’ve got rather used, in recent years, to Bailey caravan lounges that are frequently a significant cut above the competition. One of the reasons the Unicorn Seville is our reigning tourer of the year, for instance, is its simply jaw-dropping interior. Unfortunately, while the Modena’s lounge is far from awful, nor is it the best we’ve ever seen. Part of the blame can be laid at the door of our test model’s optional ‘Belvoir’ upholstery; it’s smart enough, but on balance (and we admit that this is a purely subjective observation), we think the much lighter standard ‘Richmond’ scheme contributes markedly to a feeling of greater interior space. And if there was always going to be a cost to squeezing the Verona’s interior into a much smaller caravan, that cost is most apparent here. Where the Verona’s settees are of a uniform length, the Modena’s are most definitely not, the net result being an offside settee that’s not far short of a foot longer than the nearside one (there’s just two inches in it). Since this is a caravan that will almost certainly be bought by couples rather than small families, this isn’t actually a problem by day (the additional length opens up sitting room for another guest, after all), but does result in a rather odd-shaped double bed, and precludes the fitment of the usual central chest of drawers. The good news is that the Pegasus’s new Unicorn-style woodwork looks terrific, and the oversized central window makes a world of difference in terms of the amount of daylight that’s admitted. Yet more is allowed in by the large opening rooflight further back. There’s a superabundance of 12v lighting in here, too, including the usual adjustable reading lights, together with a profusion of fashionable ceiling pin lights. It really does look and feel as impressive in here after dark as it does by day. And full marks are due to the jumbo-sized TV dresser just inside the main entrance doorway. The Modena’s kitchen was always going to have to be quite a compact affair, so Bailey has done well to get so much in there. Worktop space is restricted to the fringe around the sink, with the space off to the right of the cooker intended as pan-handle space, but this is easily expanded by the simple expedient of the folding extension flap to the left of the sink. We’ve no complaints about the kit on offer, either: the cooker is the same as the one you get in any other Pegasus IV, so it comes with properly segregated grill and oven areas and a hob fitted with an electric hotplate as well as three gas burners. The microwave oven comes fitted as standard, too, and while high and low cupboard space is a little compromised, the fridge is a perfectly acceptable 103-litre affair. Unlike some other models within the Pegasus IV range, the Modena’s end washroom really is a proper full-width affair, with no space-sapping wardrobe in there taking up valuable room. You enter via a door offset to the left of the French bed and are faced by the Thetford swivel loo dead ahead flanked, on the rear wall, by a couple of shelves. It’s a shame the rear window isn’t frosted over, though – you might want to draw the blind while you’re spending a penny! That rear window also precludes the fitment of a vanity mirror, which is a rather more serious oversight, we think. There’s plenty of room for a (frosted!) window on the offside wall, behind the toilet, so we can’t help thinking that would have been preferable. Thankfully, the fully-lined separate shower saves the day by being of a generous size, equipped with a four-square shower tray and kitted out with a moulded-in shelf, pop-up roof vent and a pair of powerful halogen lights. We admit that we’ve been rather critical of the Modena’s lounge area, but while the unequal length settees do create an equally non-uniform double bed, it’s hardly a disgrace at 1.9m (6ft 3in) long and not far short of 4ft wide. There’s a reasonable amount of room on the narrow but full-width front shelf for loose change, spectacles and the like, too. Obviously, though, the whole raison d’être of this caravan is the huge 1.9m x 1.34m (6ft 3in x 4ft 5in) fixed French bed out back, which somehow manages to match the bed in the much bigger Verona caravan, inch for inch. It all feels very cosy in there, too, with such niceties as individual reading lights, a padded headboard and a knick-knack shelf each among the pleasing detail touches. If we have a small complaint, it’s that we could see no evidence of a privacy divider or curtain – more evidence pointing to the front bed’s intended only occasional use, perhaps? All due respect to the Modena for putting in a fighting performance here, despite its truncated overall size. As we’ve already mentioned, the kitchen’s available storage is a little wanting, but elsewhere, it’s pretty good news all round. The French bed void is obviously the biggie, here, although while the space in there is large and clutter-free, we don’t recommend putting anything heavy in there until you’re safely pitched-up. The roof lockers in here are unusually generous, too, with two shelved and two empty, in addition to a pair of open-fronted corner shelves. Up front, the offside bedding locker is neatly divided in two, with the rear half full of heating and boiler paraphernalia and the forward portion impeded only by the presence of a blown-air heating duct near the wall. Its counterpart opposite, though, is clutter-free and, better still, accessible from the outside. The wardrobe is slightly less successful. It lives opposite the French bed and is effectively triangular in shape. There’s a couple of shelves and decent hanging space in there, though. 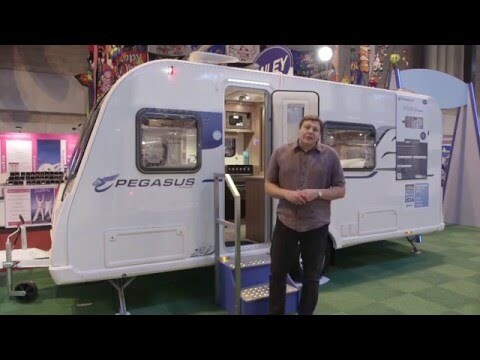 If you don’t mind the compact kitchen and odd-sized settees, then the 2016 Bailey Pegasus Modena makes a strong case for itself, for anyone interested in the Verona, but put off by its size, weight and price. With a super French bedroom and spacious (if not entirely perfect) end washroom, it’s a welcome addition to the Bailey Pegasus range.